It’s that time of year. You know, when the days start to get warmer and out of nowhere an 80+ degree day pops in and dinner time rolls around and you’re like, “Um, no. It’s not happening. I’m not cooking, uh-uh, no way, no how, it’s too hot. Bleh!” Tell me I’m not the only one who feels that way on really warm days? I love salads and I have a ton of great recipes written down, but I’ve yet to feature any of them on the blog because my salads feature so many components I’m pretty sure y’all be like “She’s crazy, there is NO way I’m doing all that just for lettuce.” So, because of the little voices in my head, I don’t post salad recipes. This week I decided to change all that because I had some lentils that I needed to use up. I also had some bacon that was about to go bad. Yeah, I didn’t think it was possible, either, but interestingly enough if it gets lost in the back of your fridge, it *may* just start to get funky on ya. Anyway, I had bacon about to turn fuzzy on me, lentils that needed consuming, and the last of the carrots and celery were calling my name. I decided I’d make a salad. This dish goes best with a green called Frisée. It’s a pretty lettuce that reminds me of what my hair would look like if I stuck my finger in an electrical outlet. And if my hair was pale green. And if it were a leafy green. The day I made this salad, I ran to the store and they didn’t have any Frisée. No problem, I’ll just finely chop some Romaine hearts. Basically the same color, similar in texture and it’ll do just fine for the photo shoot. Well, the lettuce did just fine, but the lentils look like dog food. Boo! I inhaled the entire bowl of this salad after I took the photos. It was SO yummy. 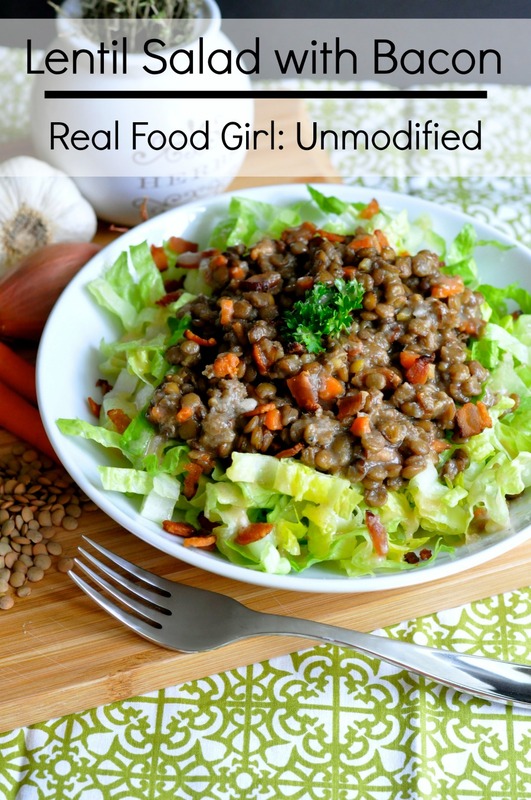 These lentils tasted fantastic on their own, but the vinaigrette brings it to a whole new level! I went back to the store the next day 3 different stores and could not find Frisée anywhere. I swear South Carolina is conspiring against me and lettuce snobs everywhere. Not cool SC. Not cool! Because this salad is truly fantastic. Yeah, so because it’s got bacon and I violated my fork whilst chowing down this salad, I knew I had to share it despite the less-than-fantastic photographs and the lack of Frisee lettuce. I bought more lentils, and bacon and I’m going to run out to Kroger tomorrow to see if maybe they have some Frisée. If they do, I’ll update the photos ASAP because my current attempts at capturing this subtle yet robust tasting salad fall dreadfully short of my mission. It’s not dog food- it’s lentils. Ha! I should approach the lentil vendors of the world and offer them my new tagline for lentils. It’s not dog food. They’re lentils! Lentils anyone? Ha! I’m too funny. 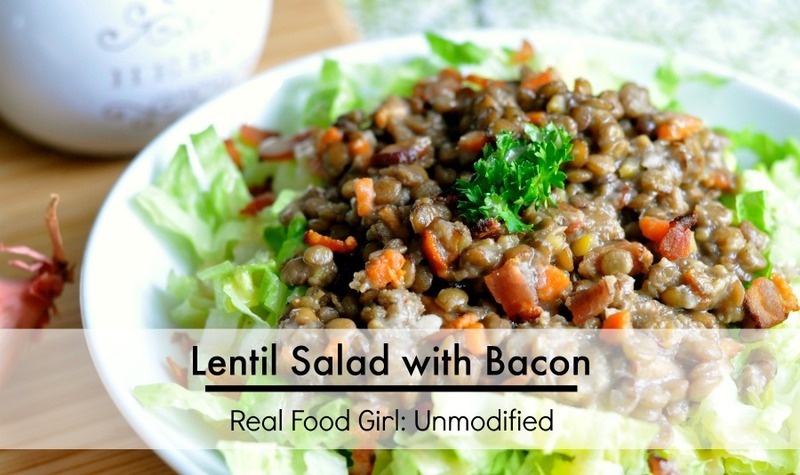 This salad tastes best when you let the lentils cool slightly and then lay them atop your greens. This salad tasted just fine using Romaine but there is just something about Frisée that brings a new dimension to this salad. The tender, frizzy leaves are slightly bitter so they pair nice with the bacon-studded lentils. Romaine adds a nice crunch factor, but Frisée is better. Just trust me. Oh, when prepping Frisée, never cut it with a knife. Always tear it. The inner leaves are more tender than the outer leaves. How often do you cook with lentils? Do you prefer them in side dishes and soups, or do you like them in salads? 1 bunch organic frisée, tough stems removed or 2 heads of Romaine cut into 1/2 inch ribbons. In a blender, combine the garlic, sliced shallot, vinegar, mustard, olive oil, salt and pepper. Process until smooth and set aside. In a large saucepan over low heat, cook the bacon, stirring occasionally, until almost crisp, about 5-6 minutes. Using a slotted spoon, transfer to paper towels to drain. Return the saucepan to low heat, add the minced shallots to the bacon fat and cook, stirring occasionally, until softened, about 4 minutes. Add the celery and carrot and cook, stirring occasionally, until wilted, 3 to 4 minutes. Add the lentils, broth and enough water just to cover the lentils. Bring to a boil, reduce the heat to low, cover and simmer gently until just tender but not mushy, about 20 minutes. Add a little more stock if the lentils become too dry. Remove from the heat and let stand, covered, for 5 minutes. Immediately add a third of the vinaigrette and gently stir to combine. Stir in 3/4 of the bacon. 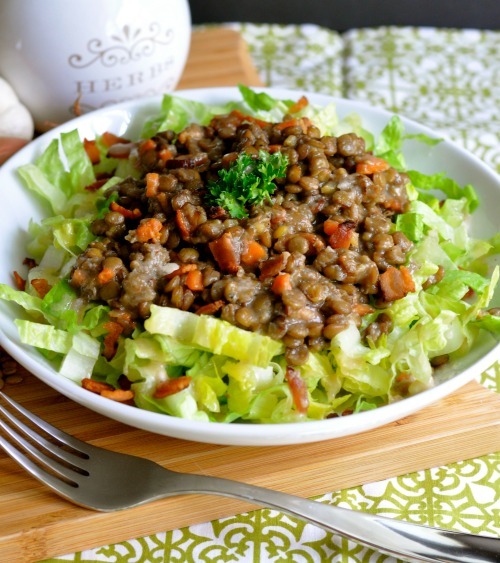 Scatter the frisée on individual plates and spoon the lentils over the top. Drizzle a little vinaigrette over the salads, garnish with the remaining bacon and serve immediately. Serves 4. The remaining vinaigrette can be kept in an airtight container in the refrigerator for up to 1 week.